I love the "pent-up demand" argument that Keynesians use to explain this boom. As if tens of millions of people were just sitting around the table during the recession saying "Ya know, we're poor as dirt, but we can't think of any services or material goods that would improve our living conditions. Nope, not a one. Dirt poor works just fine and dandy. Good thing we've got a government to demand stuff for us." What led to the massive American economic expansion after war was simple. In August of 1945, outside of the US, the rest of the world's industrial base lay either 1) behind the Iron Curtain or 2) in smoking heaps of rubble (thanks largely to American bombers). @CTD, it would be interesting to see how true your claim is. I know Germany was well bombed. But just what state were factories in England, France, Spain, etc. There were large parts of the world completely untouched by WWII. Also import export, while it existed was a much smaller percentage of the economy back then. You really think exports could suddenly increase our entire economy 10%? Could you imagine suddenly exporting 10% more today? 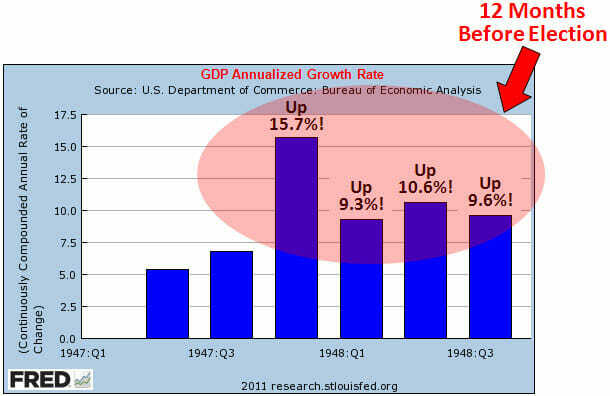 Seems like what you mentioned were contributing points, but does not account for a majority of that Truman growth. It really would be interesting to see some scholarly article on the subject. But....it saved or created 3 million jobs (plus or minus 2.6 million) -- our models told us so! We have evidence! but in fact Truman inherited what should have been, by Drum’s Keynesian thinking, the worst economic situation ever since an enormous amount of government spending was going away after the war and new workers were simultaneously flooding back into the job market. If any time in recent history should have demanded Keynesian stimulus, this was it, and yet a do-nothing Congress led to a massive expansion. Hmmmm. There are several high-profile refutations of Keynesian fiscal stimulus. This is one of my favorites. Maybe it is because Russ over at Cafe Hayek frequently calls attention to it and the fact that Paul Samuelson, a prominent Keynesian at the time, famously predicted dire economic consequences as a result of reduced government spending after WW II. Didn't quite come to pass. We could get this economy going again if we all just go outside and break some windows. That will create jobs for window repair men and orders for glass companies and that will increase consumer confidence, spark demand for all kinds of goods and services. Just a few placed bricks and our economic woes are over.
" We could get this economy going again if we all just go outside and break some windows." or go invade some country and then proceed to nation build them, eh? Drum is just projecting. He knows Democrats would be willing to lose a war or tank the economy if it meant winning the next election. The gummint diddled before WWII -- putting investors on the fence for good --- FDR personally reported to even daily diddling with the price of Au ... on a whim basis. The war came, and was won. The gummint didn't have time to diddle and mess stuff up, and there was a lot of saved up vacation time and saved pay in the banks ... and many vehicles were way over their economical lifetime... see above ... so moneyh + demand + gummint too slow to eff it up == boom time. Plus people were happy to be HOME and in one piece more or less. See: birth rate. Reduced spending and lowered tax rates did it. [edited] What happened in 1945 at the end of WWII? FDR was convinced the only way to employ the 12 million returning soldiers was another New Deal program, but he died before he could impose his plan. The new President Truman proposed it, along with national health care. Both the Congress and Senate had Democratic majorities. They said "No" to the whole New Deal revival: no federal program for health care, no full-employment act, only limited federal housing, and no increase in minimum wage or Social Security benefits. Instead, Congress reduced taxes across the board. Top marginal corporate tax rates effectively went from 90% to 38% after 1945. By the late 1940s, a revived economy was generating more annual federal revenue than the US had received during the higher tax rates of the war years. Price controls ended by the end of 1946. The US began running budget surpluses. Unemployment had remained double-digit throughout the whole New Deal. One year after the end of New Deal policies and the return of economic freedom, it was under 4% despite the return of a huge number of soldiers. World War II greatly reduced the productive capacity of Europe. There are claims that it was this unusual factor which led to an economic boom in the US, as we tooled up and sold them huge amounts of stuff. Question: With their society in ruins and their industrial capacity destroyed, what did they pay us with? That is, what were the huge exports to the US that paid us for our booming production? Net US exports in 1946 were 0.3% of GDP, not enough to support our observed economic growth. Net US exports have declined since then. An economy can boom without exporting, merely by efficiently putting everyone to work on useful things. Conversely, Greece and Spain are going broke despite having an intact industrial infrastructure. Leftists claim that the government spending of World War II, rationing, and the conscription of soldiers (giving everyone a "job") somehow produced prosperity. But, what possible mechanism produces prosperity out of war? People can't eat or enjoy tanks, and shooting people produces nothing of value beyond winning. In reality, WWII interrupted FDR’s plans and changed the mood of the American people, leading them to reject big government. It was the post-war reaction of the people against FDR’s policies that resulted in good policies and renewed prosperity. Hahaha, Drum must have scored a 32 on Simon's test over at Classical values. I'm not surprised.